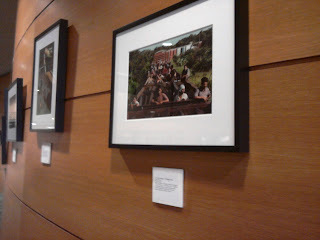 A selection of Don Bartletti's photography is visible in the center of Sonia Nazario's Enriques' Journey. His impressive series, "Bound to El Norte," which won the Pulitzer Prize in 2003, illustrates the dangerous journeys of many immigrants on their way north to the United States. In an essay titled, "Immigration to El Norte: Eight Stories of Hope and Peril," he describes the stories behind some of these photos. This series is currently on exhibit in the lobby of Memorial Library on the UW Madison campus until February 27, and will be at Ebling Library from March 1-30. We invite members of the campus community to stop by and view Bartletti's gripping collection, an inspiring complement to this year's Go Big Read selection. Fascinating exhibit! Thanks for sharing. To me the most fascinating photography is of people in highly emotional situations.